force on the last day of a turn. As always, thank you very much for your selfless efforts! I started a PBEM game on 1.16 and we switched to 1.16a RC2 a few turns ago, so this doesn't just pertain to the RC. 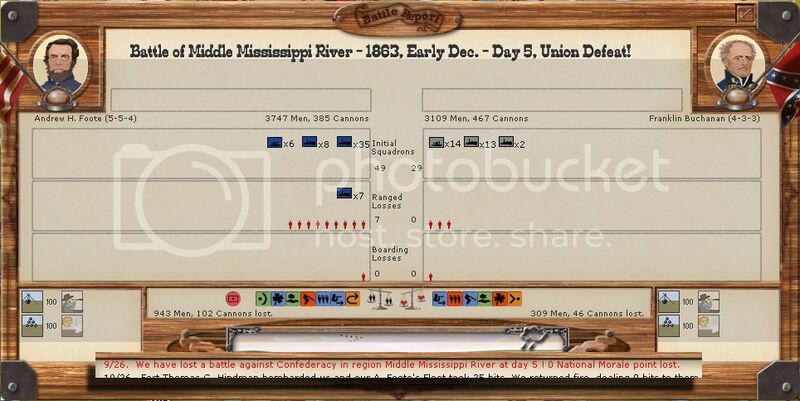 Foote and Buchanan are battling over the Middle-Mississippi region -- Arkansas - Mississippi River confluent -- in front of Bolivar; I'm blockading Bolivar and my opponent is trying to break the blockade. A couple of turns ago he attacked Foote's fleet and threw me out. He sank one of my gunboats and got 0 NM. Next turn I came back with some reinforcements and threw Buchanan out. He lost 1 gunboat and I lost 4 and I got 1 NM(!!). Can this be WAD; and if it is, how? Thanks for this rapid information ! !